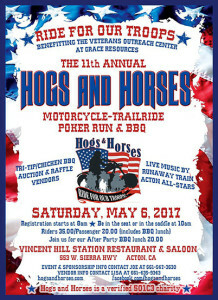 ACTON, Calif.—Hogs and Horses, the motorcycle poker run and trail ride, will be honoring veterans at the May 6 barbecue and entertainment, one of them a paratrooper veteran of the Korean War, and also the first female soldier to be recognized by the volunteer non-profit that supports the veterans outreach organized by Grace Resources. Vito Canzaneri is a paratrooper who served in the Korean War with the 187th Regimental Combat Team in 1950-51. The group provided immediate support and relief for the 1st Marine Division, which made the first daring counter-attack of the Korean War, wresting the South Korean capital of Seoul away from the North Korean communist forces under the command of Gen. Douglas MacArthur. Later, Canzaneri did a combat jump with the 187th RCT into the North Korean capital of Pyongyang. At one point in the war, Canzaneri, a machine gunner, suffered a leg injury from a jump and had to be evacuated. The group will also honor Army Spec. Ashley Bang, 23, who has deployed to Kuwait in support of operations in Iraq and Afghanistan. 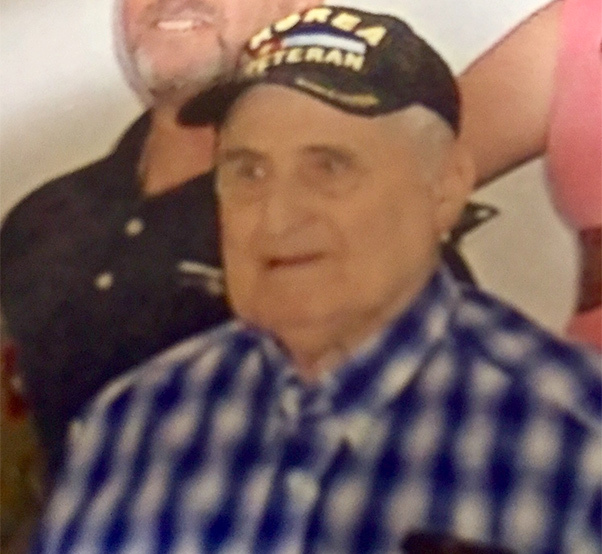 Also to be honored in memoriam is Joe Tubbs, a Korean War veteran who was the volunteer trail master for Hogs and Horses down through the years. Tubbs died recently, according to the Hogs and Horses President, Joe Probst, and the group wanted to honor his memory and service. Hogs and Horses, the nonprofit group that helps support the Veterans Outreach program run by Lancaster-based Grace Resource Center, is heading into its second decade of working on behalf of the troops. The 11th annual spring “Ride For Our Troops” is preparing for its May 6 charity “poker run,” which will have one course along Antelope Valley roads for motorcycle riders and a second in the hills near Acton for equestrians. “We are supporting Grace Resource Center and their veterans outreach because they are an excellent partner in helping our veterans, especially those in need in the Antelope Valley,” said Probst. The group has been rolling and riding since 2006. “Our goal remains the same,” he said. “We want to raise awareness, raise money, show our support and respect for our troops, and have a great time while we are doing it. The riders and motorcyclists will be supporting Grace Resource with money raised for food, clothing, medical and dental care, counseling, job placement and other needs of service members returned from their tours of duty. The poker run participants gather May 6 at Vincent Hill Station Restaurant, 533 West Sierra Highway, with registration at 8 a.m. The rides start at 10 a.m. Riders returning from the run around 1 p.m. will be served a barbecue lunch of tri-tip, chicken and all the fixings. 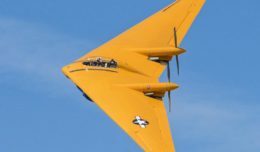 Cost includes lunch and is $35 for riders, $25 for passengers and $15 just to show up, support the troops, and enjoy lunch and entertainment. Active military personnel with identification are encouraged to attend as guests. For more information, visit www.hogsandhorses.com or call 661-547-3630.